Vidgle - Tag Archive for "intervention"
Candice discusses her experience of Intervention 2012 in Rockville, MD. It’s the third and final day of Intervention 2012. Candice will explore to see what attendees had to say about their experience of Intervention. It’s the second day of the annual internet culture convention, Intervention. Candice will interview panelists, guests, vendors, and artists to see what goes on during the con. Candice is at the internet culture convention, Intervention, in Rockville, MD. 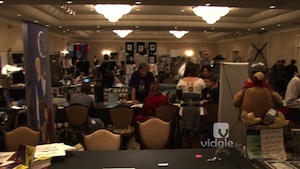 On this episode, Candice will talk to some of the vendors and guests of the convention in the dealers room on the first day of Intervention 2012! Anthony talks with Tom about the DC-metro anime convention, AnimeUSA. J-F talks with Sarah from Echoes of Empires at Intervention. They will discuss about LARPing and the activities that Echoes of Empires have done at Intervention and other events. Anthony and Nick joins in for “MAGFest Chat,” which we will talk about the music and gaming festival, MAGFest. MAGFest will be taking place January 5-8, 2012 at the Gaylord National Harbor in National Harbor, MD.